Looking for a way to use up those ripe bananas on the counter? 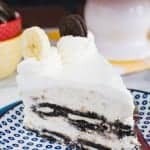 This easy Banana Split Coffee Cake has all your favorite ice cream toppings in a delicious breakfast cake. It’s the perfect way to start out the summer. **Love these recipes? Be sure to sign up for the BruCrew email to have these recipes sent to your inbox each time a new recipe is share. Summer officially started for us this week. Our kids are out of school. Bring on the sun, the shine, the pool, the ice cream, and all the fun that comes with these things. Now obviously those things can’t happen every single day because work, cleaning, chores, and sports still keep going even though summer has arrived. We need to create a list of fun things to do at the house for days we have to work because I know the kids are going to start asking to watch tv all day long. Eating ice cream and banana splits are always good for hot summer days, so that needs to be on the list. What am I saying? Ice cream is good all year long, right? I have a thing for adding banana split flavors to all kinds of treats. Remember this Banana Split Fluff Salad and this Banana Split Bundt Cake? Well, now banana splits are not just for dessert. That’s right!!! 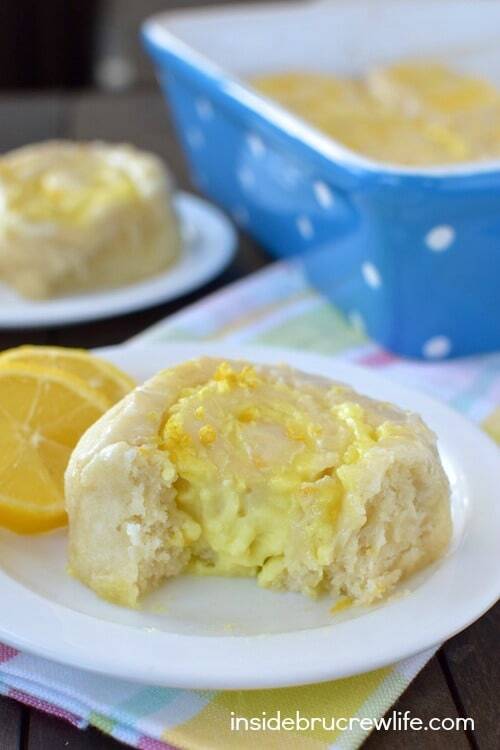 I found a way to incorporate one of my favorite summer combos into a breakfast cake. 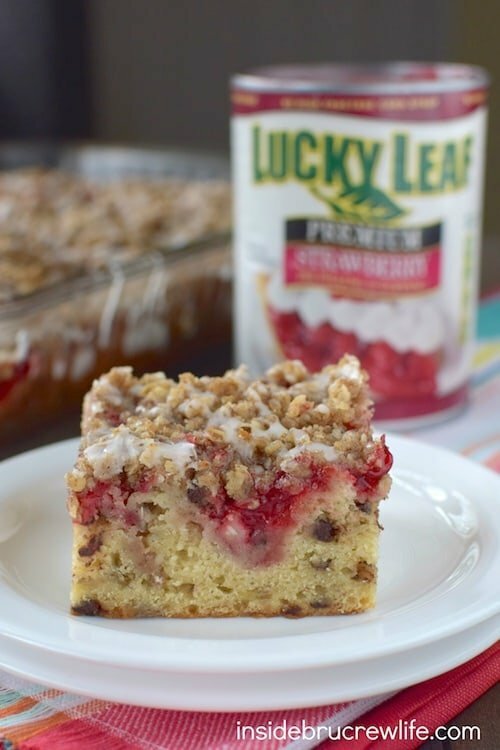 As a Lucky Leaf® blog ambassador, I am always looking for fun ways to use pie filling in my baking. Have you had a chance to try their pie filling? They are absolutely delicious and packed full of fruit. The other great thing is that they do not use high fructose corn syrup in their fillings. I had a few ripe bananas on my counter that needed to be used, so I decided to give this Banana Toffee Cake a summer makeover. I added mini chocolate chips and walnuts to the batter, then swirled in some strawberry pie filling. Then I decided to get all crazy and add a crumble to the top since I took out the cinnamon swirl from the original cake…yeah, that was an awesome thing to do! And then to top it all off (and to make it look pretty) was a drizzle of glaze after the cake had cooled! This cake seriously got better every single day it sat on our counter. I mean it was delicious that first day with my coffee, but it was just as great on day 4 too. I don’t really want to admit how many slivers of this banana split coffee cake I ate. The cake just kept calling out to me every time I walked through the kitchen. Go into the kitchen for coffee…eat cake. 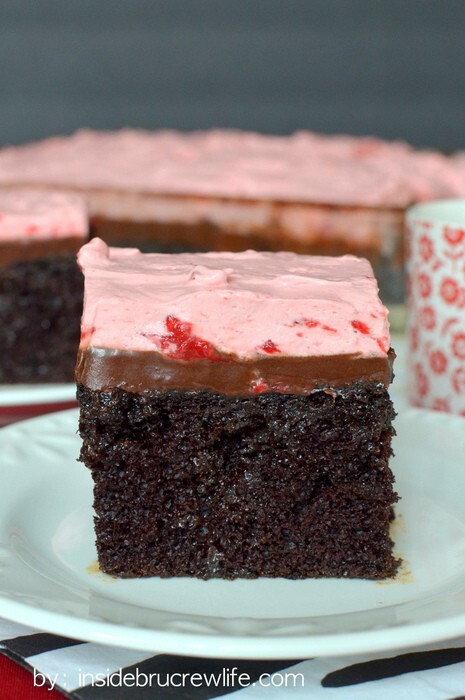 Head through the kitchen to do laundry…eat cake. Make dinner…eat cake. Come home from working out…eat cake. I like to call it a work hazard. Hey, someone has to take one for the team and eat the cake, right? Adding your favorite ice cream toppings to banana cake creates a fun summer coffee cake. It just gets better and better every day. Beat the cream cheese, butter, and sugars until creamy. Add the eggs, banana, and vanilla and beat again. Stir together the flour, baking powder, baking soda, and salt. Slowly beat the flour mixture into the butter mixture. Stir in the chocolate chips and walnuts by hand. Spread the batter in a greased 9x13 pan. Drop the pie filling by spoonfuls on the top of the batter. Gently swirl the pie filling into the batter using a knife. 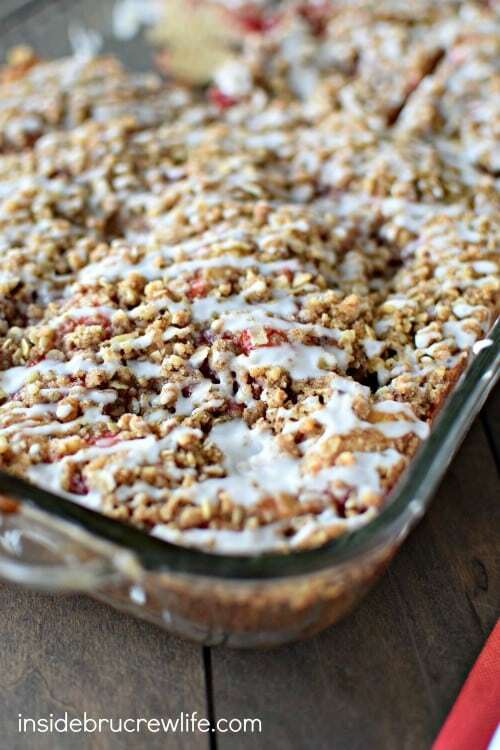 Stir together the crumble topping until it resembles sand. Sprinkle over the top of the batter. Bake at 350 degrees for 42-44 minutes. Do not over bake. Remove and let cool completely. Stir together the glaze ingredients and drizzle over the top. Let set. Cut into 24 squares of cake. Store in a sealed container on the counter. Thanks, Melanie! 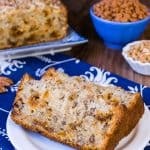 Your hubby would definitely love this fun banana cake! 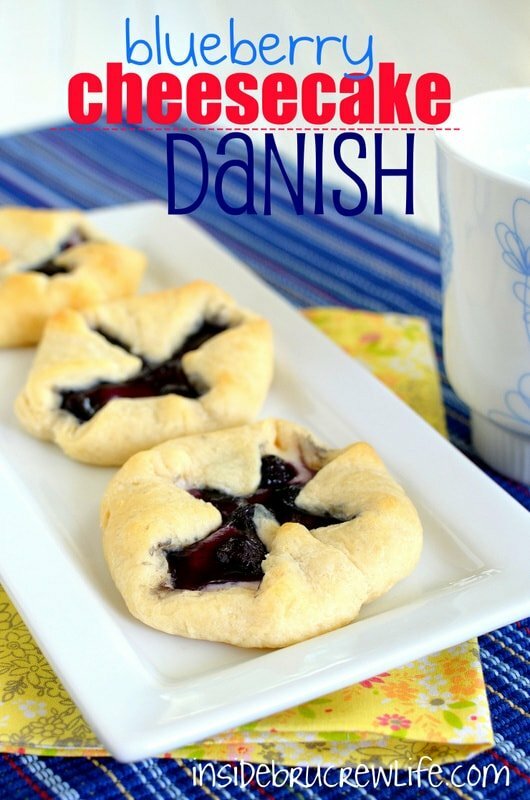 Looks so good – just pinned it to make this weekend! Thank you for the pin love. I hope you enjoyed the cake! 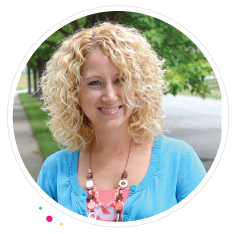 I am so jealous that your kids are done. I’m a teacher and I have three more weeks to go! I can’t believe this coffee cake. 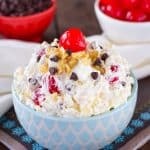 You’ve taken banana splits to yet another level! I knew you could! 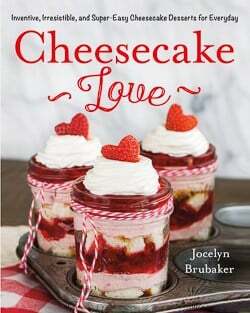 Oh love the sound of this coffee cake, Jocelyn! It looks gorgeous, and delicious! What a great treat to go alongside my morning cup of coffee! Thank you, Gayle. It was the perfect breakfast treat…and afternoon snack and midnight munchie! LOL! 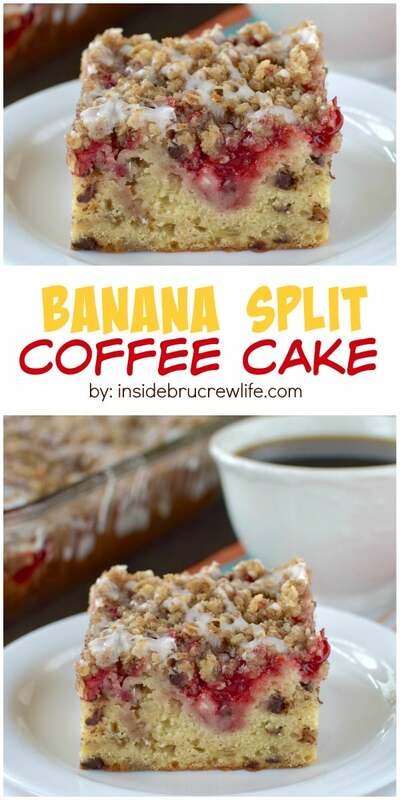 The words Banana Split + Coffee + Cake=OMG I can’t wait to try this. Looks amazing! First of all I am totally impressed that the cake lasted FOUR days. Amazing! Second.. dang… this looks so good. Pinning! Thank you so much, Joan. 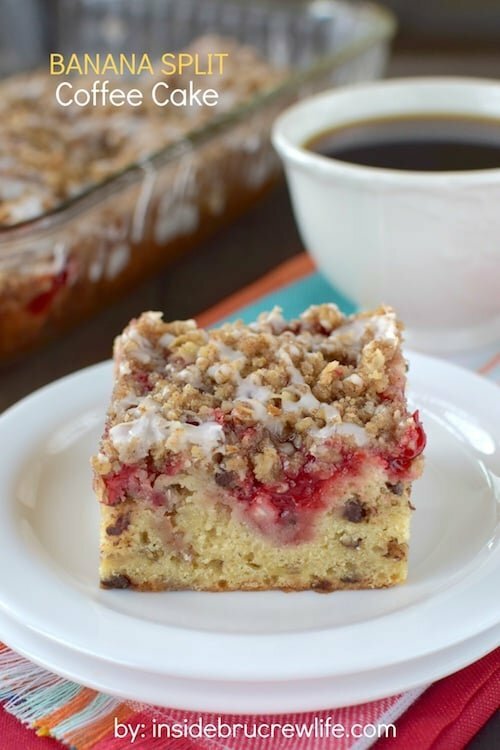 I adore a good coffee cake too, and any excuse to eat “cake” for breakfast is one I will take. This is an awesome coffee cake! I think you know I am a fan of Lucky Leaf Pie filling as well! This is such a creative way to use it! I know exactly how you feel about this yummy pie filling 🙂 It’s the best! What a creative twist on coffee cake! It looks delicious! Aaaah yes, I’m waiting for the day my baby girl can ask for the TV. When I was nannying the summers were always the hardest to get the kids motivated. I admire all parents who do it successfully! 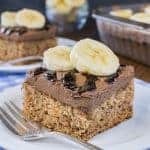 I have to say, I would immediately switch off the TV for a slice of this banana split coffee cake – looks absolutely fabulous! SO into this. I may or may not have said “oh yeaaah” when I opened up the first picture in the post. This is a perfect creative coffee cake! My kids are still in school for a few more days but I’ve been thinking that they need to come up with a list of things to do this summer too. I don’t want them on the computer or ipad all summer but it gets tricky when I still have to work. The coffee cake sounds amazing! I know what you mean…when I need to get work done is when they start asking what we can do. They understand the job part, but they are still kids and want to play all day long! Bring on more cake! This is such a fabulous idea for a coffee cake! So perfect for summer! 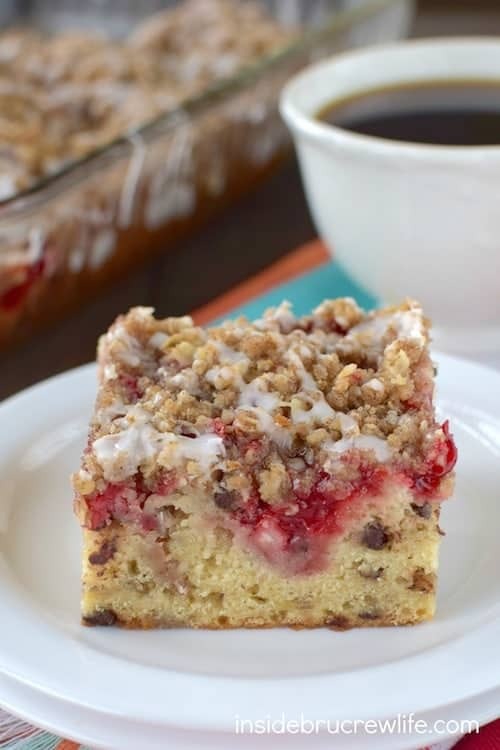 This is a delicious looking coffee cake, and that crumb topping..so yummy! The strawberry pie filling adds such a nice splash of color. Great cake! Can you use frozen bananas. I must have at least 6 ! If so, I think I would have to thaw them ! Am I correct in this assumption. 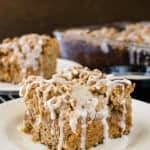 I would love to make this coffee cake since the ingredients sound yummy ! Looking forward to your response . Thanks, Pat D.
Hi, Pat. Yes, you should be able to use frozen bananas. I would thaw them and drain off any of the excess liquid from thawing before mixing them in. I hope you enjoy it. I was looking for a new recipe for a morning treat at the office. This looks great! Thanks for sharing. Can u use fresh smashed strawberries instead? 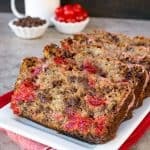 Could i use canned cherries instead of strawberries? Do you mean cherry pie filling? If so, yes, that would be good too!